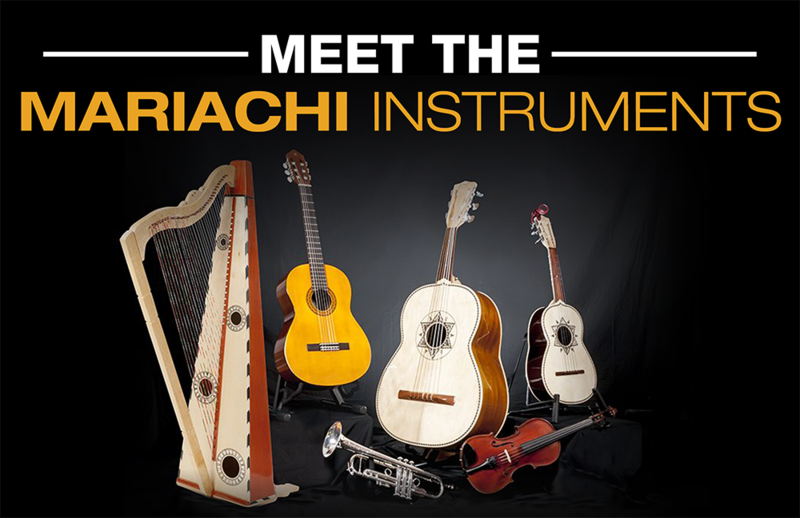 Let’s take a look at the musical instruments that make up the Mariachi Ensemble! It is essential to learn the necessary, fundamental qualities and attributes of these musical instruments to understand Mariachi music truly. People all over the world have become familiar with Mariachi music, but do not always know the names or background of the instruments played. After exploring each instrument, you will have the ability to share this knowledge and in addition to your passion for Mariachi music. The Mariachi musical instruments include the Guitarrón, Vihuela Mexicana, Harp, Guitar, Violin, Trumpet, and Voice. The Guitarrón is a large bass guitar. Guitarrón translates to large guitar – the suffix means big or large. It has 6 strings. Three are nylon wound with a nylon monofilament core or nylon fibers. The other three strings are steel, bronze, or copper wound with a single steel string core. The sound is produced by pulling the strings is loud and powerful. This instrument has a distinctive timbre quality that is warm and colorful. The large hollow-body, with the convex back, enhances the lower frequencies. Thus producing a rich bass sound. The fingerboard (el díapson) is fretless. The tuning mechanism can be metal machine heads or wooden pegs (the wooden pegs are called las clavijas). The strings are heavy gauge, and the tension is firm. An exceptional and specific left-hand technique is required to depress the strings. Support, clarity, and intonation are essential when producing the desired notes being played. Left-hand strength is desirable but not necessary. The right hand is used for plucking or pulling (el jalón) two strings simultaneously near the sound hole of the Guitarrón. When the two strings are played together for each written note, they play in octaves. Pulling on a single string instead of double string also produces warmth and color of the notes played. The fretless fingerboard is used to depress the string, to stop) with the fingers in certain positions thus producing the notes desired. The role of the Guitarrón functions as the backbone of the mariachi ensemble. It provides the bass line, the primary rhythmic pulse, and primary musical guide. Paired with the guitar and vihuelas, together commonly referred to as the rhythm section or las armonías. It is interesting to note that the Guitarrón eventually replaced the harp as a bass instrument. The Guitarrón was the instrument preferred by the mariachi musicians in central Jalisco. The VIHUELA MEXICANA is a traditional instrument used in Mariachi music. It is physically similar to the Guitarrón but on a smaller scale. The sound produced from this musical instrument is that of a tenor guitar. The body or the sound box is much smaller than a guitar, and the vihuela has a convex back. In Spanish, it is called “la joroba.” The tuning mechanism on the headstock is metal machine heads or wooden pegs, which is called las clavijas. The Vihuela Mexicana has 5 strings and is tuned similarly to the guitar. The difference is the G, D, and A strings are tuned an octave higher than a guitar. Thus it gives the instrument a higher pitch. 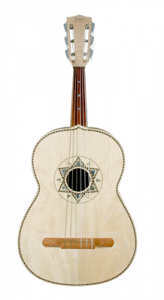 The tension and gauge of the strings and the order of which they are applied to the instrument can vary depending on the type of sound desired from the vihuela. These decisions have the ability to produce a soft sound or a punchy bold sound when the instrument is strummed. The strumming action is called a mánico. The strings used for the Vihuela Mexicana are monofilament nylon and in some preferred cases, nylon wound. 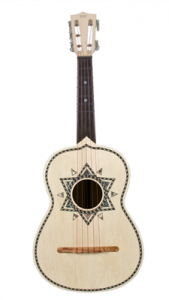 This instrument is strummed (los mánicos) with all of the fingernail tips to produce a rich, full and clear sound. A finger pick (la púa) on the pointer finger (1st finger – dedo índice) gives it a brighter and clearer sound when strummed. Many vihuela players have longer than normal fingernails on their strumming hand to facilitate their playing technique and to get a crystal clear sound. The optimum spot to strum this instrument is between the sound hole and the point where the fretboard or neck meets the body of the instrument. This is the same linear area between the upper and lower bouts closest to the fingerboard. The frets on the Vihuela Mexicana are tightly tied nylon string. Melodic lines are not usually played with the Vihuela Mexicana. It is considered a stringed chordal instrument. The role of the Vihuela Mexicana functions as the secondary rhythmic support instrument to the Guitarrón. It provides the rhythmic, syncopated pulse and musical guide along with the Guitarrón and the guitar. The Vihuela Mexicana provides and maintains the tonality for the ensemble, which is the pitch preference. The Guitarrón, Vihuela Mexicana and Guitar together are commonly referred to as the rhythm section or las armonías). The Vihuela Mexicana was the instrument preferred by the mariachi musicians in central Jalisco. Did you know that the Jalisco Harp was the original bass instrument in the mariachi ensemble? The Jalisco Harp was the instrument preferred by the mariachi harp players in southern Jalisco and Michoacán. One reason the Guitarrón eventually replaced the mariachi harp because it was easier to carry from place to place. Also, there were violins to play the melodic lines that the harp once played. When playing the mariachi harp, the left-hand plays the bass line, and the right-hand performs the melodic line. Together, the harpist could play the bass line and the melodic line without any other melodic instrument accompaniment. The vihuela was used to accompany the harp and function as the rhythmic pulse. The harp is a large instrument and played while the harpist is standing. 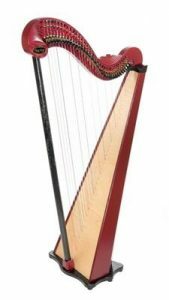 The Mariachi Harp today could have up to 36 strings, monofilament nylon, and nylon wound or wrapped bass strings. If you look closely at the length of the strings, the shorter length strings have a higher (tenor, soprano) pitch and the longer length strings have a lower (bass) pitch. Tuning the harp can be challenging. A metal tuning key is used to alter the tuning of the harp strings from one key signature to another. When tuned, the harp could have a range of 4 to 5 octaves. Did you know the original strings for the harp were made of gut? The role of the Harp in today’s mariachi ensemble is to play the bass line along with the Guitarrón. It can also provide a melody line but generally not as frequently as it was once played in the past. The harpist can even play chords and arpeggios as per the specified musical arrangement. Though the Jalisco Harp style with a Tacote top is commonly used in the mariachi ensemble, the Veracruzana Harp style with a cedar top is also used. Thank you for taking the time to meet the mariachi instruments! In our article, we focused on the lesser known instruments: Guitarrón, Viheula, and Harp. We hope you check back often at westmusic.com/blog to learn more about mariachi education, including the other common instruments in the mariachi ensemble, which include violin, trumpet, guitar, and voice.